It's been one month since my last diary on malcious spam (malspam) with links to malicious Word documents containing Hancitor . 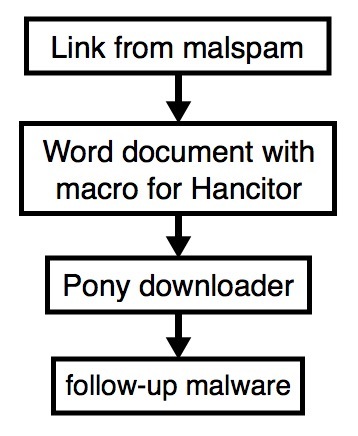 Back then, we saw Hancitor use Pony to download Vawtrak malware. Since then, I've seen indicators for this type of malspam on a near-daily basis. Recently, these emails have stopped leading to Vawtrak. Instead, I'm now seeing malware that triggers alerts for Terdot.A [2, 3, 4, 5, 6, 7]. Tools from my employer identify this malware as DELoader, and a Google search indicates Terdot.A and DELoader are the same thing. For now, I'm keeping my flow chart open on the final malware. With that in mind, let's take a look at some infection traffic generated on Thursday 2017-02-09 based on one of these emails. These emails generally have different subject lines each day, and they have spoofed sending addresses. The example I saw on 2017-02-09 was a fake message about a money transfer. It's similar to a wave of malspam seen the day before. The link from the email contains a base64-encoded string representing the recipient's email address. Based on that string, the downloaded file will have the recipient's name from the email address. I used a base64 string for a made-up email address and received a file named bofa_statement_marci.jones.doc. Shown above: Fake money transfer email with link to a Word document. The link from the malspam downloaded a Microsoft Word document. 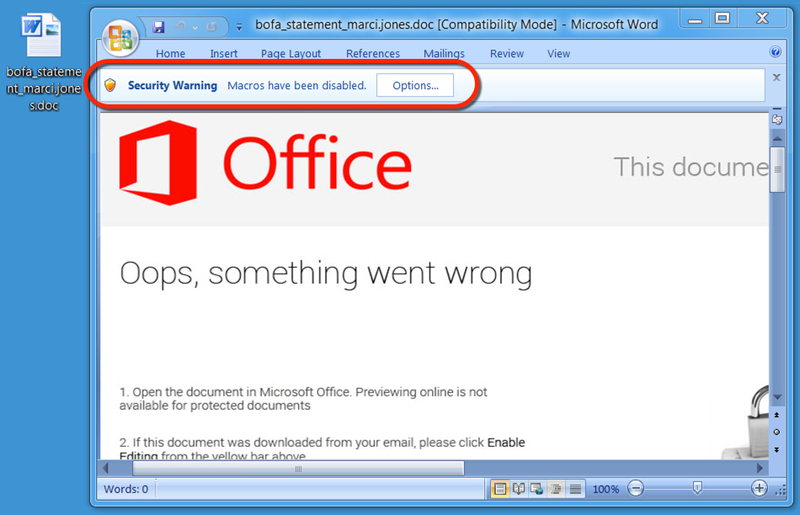 The document contains a malicious VB macro described as Hancitor, Chanitor or Tordal. I generally call it Hancitor. If you enable macros, the document retrieves a Pony downloader DLL. At first, I thought Pony was retrieving the DELoader malware; however, another researcher told me it's Hancitor that grabs DELoader. I haven't had time to investigate; however, I probably need to update my flowchart. Pattern-wise, URLs from this infection are similar to previous cases of Hancitor/Pony malspam reported I've seen during the past week or two. Alerts show post-infection traffic for Terdot.A/Zloader, which is consistent with recent infections I've seen for malware identified as DELoader. As this campaign progresses, IOCs will continue to change, and I'm sure traffic patterns will continue to evolve.